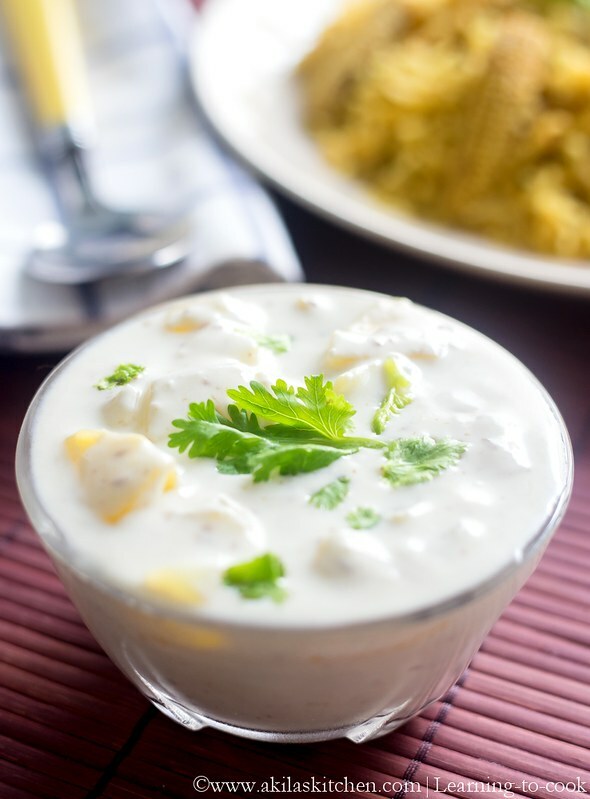 Aloo Raita or Potato Raita is actually a new recipe for me as I have never tasted this raita before. When I prepared the Babycorn Biryani, I want to try any new raita and searched for the recipes on net. When I saw the recipe here, I was thinking how the taste would be with plain aloo and the yogurt. So I decided to try and to my surprise I really loved it very much. 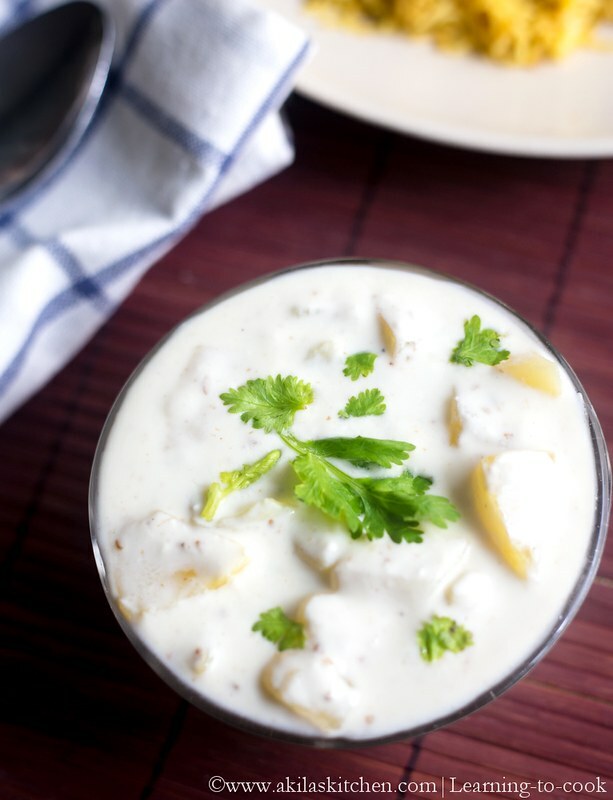 Not only me, everyone in my family liked it as this Aloo Raita is new recipe for all of us. 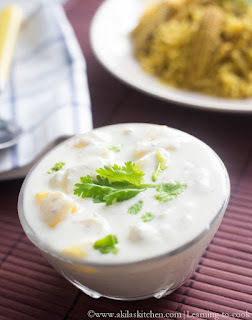 Also, when read about this Aloo raita, I came to know it is prepared for the Navratri fasting days and in those days, chilli powder are omitted sometimes by the devotees. Now let’s go to the recipe. 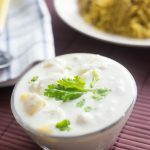 You can check other raita recipes in my blog and below are some for you to view. 1. Cut the boiled potato into small cubes. Beat the curd/yogurt nicely. It should be smooth consistency. 2. Once the yogurt attains the smooth consistency, add the black salt, salt, roasted cumin powder, chat masala, sugar and Chilli powder. (In this recipe I didn’t add the chilli powder as my lo didn’t eat the mango raita, in which I added the chilli powder). 3. Add the potato cubes and mix thoroughlly. 4. Garnish with coriander leaves or mint leaves and serve it. Yummy yummy Aloo Raita is ready. 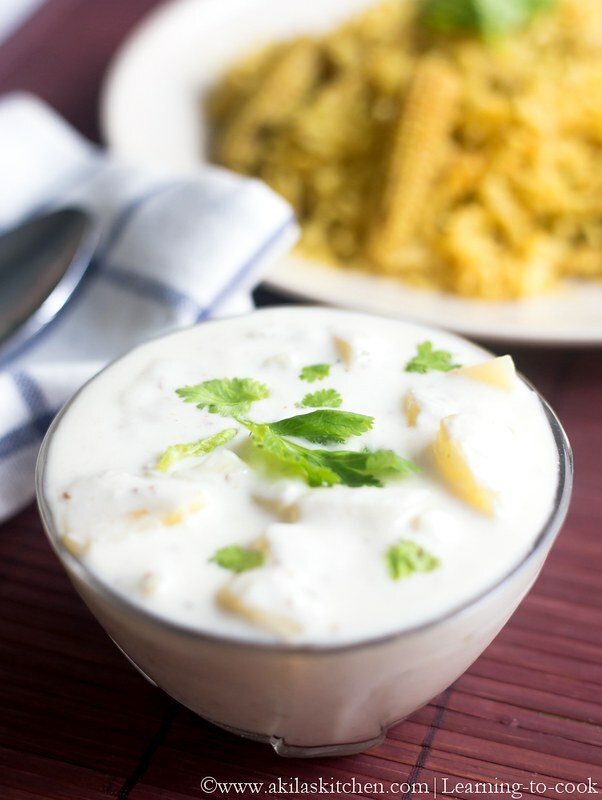 Top this Aloo Raita with some crispy boondi and serve with hot hot Pulao’s. 1. As I mentioned already in step 3, I didn’t add the chilli powder., as my lo doesn’t eat if it is spicy. But the original recipe calls for chilli powder. 2. You can also add chopped green chillies and chopped mint or coriander leaves to the raita. I used coriander leaves for garnishing alone. 3. 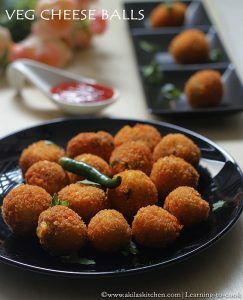 Chat masala can also be replaced by little amchoor powder or dry pomegranate powder. Cut the boiled potato into small cubes. Beat the curd/yogurt nicely. It should be smooth consistency. Once the yogurt attains the smooth consistency, add the black salt, salt, roasted cumin powder, chat masala, sugar and Chilli powder. (In this recipe I didn't add the chilli powder as my lo didn't eat the mango raita, in which I added the chilli powder). Add the potato cubes and mix thoroughlly. Garnish with coriander leaves or mint leaves and serve it. As I mentioned already in step 3, I didn't add the chilli powder., as my lo doesn't eat if it is spicy. But the original recipe calls for chilli powder. You can also add chopped green chillies and chopped mint or coriander leaves to the raita. I used coriander leaves for garnishing alone. Chat masala can also be replaced by little amchoor powder or dry pomegranate powder. Despite trying various types of other raita, this with potato is new to me. Brilliant idea and will be popular in my house. these days anything with yogurt is good.. this is no exception! yum!